Situated in the heart of the beautiful San Jose area of Jacksonville, Anglers Cove offers deep water access to the magnificent St. Johns River. With 14 total building lots, Anglers Cove provides deep water dock access to the 8 home sites located directly on Goodby’s Creek. Additionally, the community offers waterfront kayak and paddleboard storage for homes sited on the 6 internal lots. 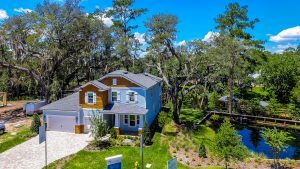 Dotted with majestic 200-year-old Oak trees, the Angler’s Cove streetscape sets this community apart from all other new home communities in today’s Jacksonville home market. Near Bolles School and San Jose Country Club, Angler’s Cove offers a select number of discerning families the opportunity to enjoy the convenience and recreation of this beautiful neighborhood, all at an excellent value. It is anticipated that this much sought after Angler’s Cove neighborhood will sell out quickly. Artisan Homes feature master craftsmanship, timeless design, energy efficient living, and built for your family’s lifestyle. Our goal is simple: “Provide homebuyers with a high quality experience, while creating the home of your dreams.” Our entire team of experienced designers and builders will guide you through the process every step of the way. If you are seeking new home builders in Jacksonville, FL contact Artisan Homes today! Artisan Homes, a Jacksonville FL home builder, provides its residents with modern home designs that are sure to meet the needs, wants and desires of your new home in Jacksonville, FL. With over 75 years of combined experience as home builders in Jacksonville, FL, Artisan Homes provides quality craftsmanship, beautiful home design, and unmatched quality construction. We pride ourselves on our reputation as a go-to home builder in Duval County and beyond. Our flagship community in Jacksonville, Anglers Cove, boasts beautiful home designs with layout options that allow you to choose the style and design that will meet the needs of you and your family. Visit our Gallery page to see some of our floor plans and designs. Our team of Jacksonville home builders are dedicated to providing a seamless and hassle-free experience when designing and then building the home of your dreams. If you are in the market for a new home in Jacksonville, FL, look no further than the experts at Artisan Homes. We are dedicated to our clients to ensure that we deliver a beautiful new home within the timeframe allotted and we strive to go above and beyond when paying attention to detail in your new Jacksonville home. Our process consists of 6 unique steps which enable us to provide you with the home of your dreams without the hassle that other new home builders in Jacksonville are notorious for. The first step is a personalized meeting with you, the potential home buyer. In this meeting, we will listen to what your goals and needs are in our Design Studio. You will then be able to choose your custom finishes, discuss Audio/Visual upgrades and any other of your requirements, such as a custom pool or patio. Next, we have a plan review meeting which is brief, yet comprehensive and will cover all the aspects of your new home build prior to requesting permits from the local government. We will finalize plans or make adjustments to your desires so that you end up with the new home in Jacksonville that you dream of. The third step is a pre-construction meeting where we will review the plans for your new home one final time prior to breaking ground. Any last minute changes will be made during this meeting and then, once agreed upon, we will finalize all construction plans. Our pre-drywall meeting is the 4th step in our process and we will invite you to your property to inspect the progress that we have made. During this meeting, we will also finalize all selections for the interior of the home and make sure that you still want the selections that you have made. The fifth time you meet with us is for the home orientation meeting. This will be a walk through of your finished new home in Jacksonville and will allow us to cover all of the specifics that you requested and ensure your satisfaction. Finally, we get to our last meeting - closing! Congratulations! You have just successfully gone through our custom process to provide you with the best new home in Jacksonville that you will ever own! We strive to make sure our clients are happy and seeing the smile on new homeowners faces is what drives us to provide the quality craftsmanship that we do for each of our customers.